Wee Leprechauns | Project | Kids VT - small people, big ideas! What can I say? Toilet-paper tubes speak to me. There's a lot you can do with this free cardboard: Two tubes can make binoculars; fill one with rice and tape the ends for an easy maraca; or stick them together for Hot Wheels tunnels. The empties also make great people. Some green paint and construction paper turn the tube into a little leprechaun for St. Patrick's Day. 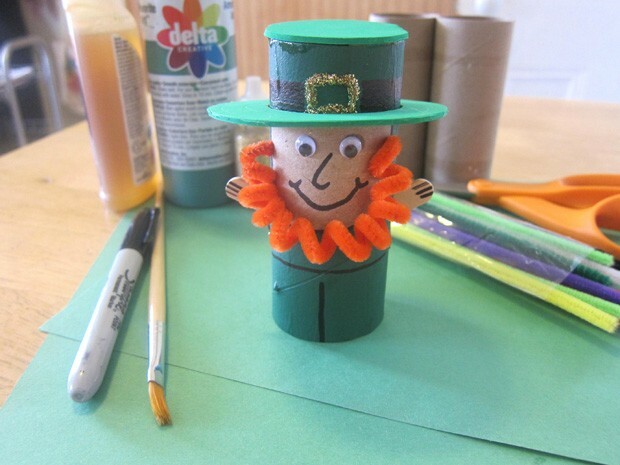 To make the leprechaun's hat, trace around the toilet-paper tube, making a circle on the green construction paper. Next, draw a larger circle around the smaller one, making concentric circles for the hat brim. Cut out the larger circle, then cut the smaller circle out of the larger one. Save both pieces. Draw a face on the tube using black marker. Parents should use the steak knife to make slits on opposite sides of the tube, about halfway down, through which you'll insert the craft sticks as arms. Paint the entire toilet paper tube green, except the portion with the leprechaun's face. Once the paint is dry, insert the craft sticks through the tube. Wind the pipe cleaner around a pen or pencil to make a spiral and then slide the spiral off. Bend the pipe-cleaner coil into a U-shape and glue this onto the front of the tube for the leprechaun's beard. Slide the larger construction-paper circle over the top of the tube into position as the hat's brim. Glue the smaller circle on top of the tube to cap it. Draw a horizontal line for the leprechaun's belt and a vertical one for his legs. Embellish the hat with a buckle or shamrocks and follow your leprechaun to the pot of gold.